WOW, have we been busy or what? We have been knocking things out so fast on our home improvement list and I am absolutely exhausted, but that doesn't mean I have completely stopped cooking and baking - although I have slowed down. My go-to meal when I am super busy is a banana smoothie loaded with PB2 so as soon as we got moved in I stocked up on bananas, but apparently, I can't get through them fast enough! Last week I was left with a ton of ripe bananas so I decided to make a few loaves of banana bread for Chance's co-workers and his parents since they came to visit. Banana bread is SUPER easy to make and this recipe is great because it keeps the bread moist - the key to great banana bread in my opinion. You can keep this bread for up to a week at least if you refrigerate the loaf so it doesn't get moldy. 2. In a large bowl whisk together the melted butter, and sugars. Add the eggs and vanilla and whisk until smooth, then stir in the flour, baking soda, and salt. 3. Use a hand mixer to blend the bananas until smooth, then fold into the mixture along with the buttermilk. Last Friday we FINALLY closed on our house and moved in, hence why I have been so M.I.A. the past week. I went back to Virginia to see my parents and gather up some essentials to prepare for the big day so that we could start living in our house the moment we got the keys. Just when I thought I had taken care of everything to ensure we could comfortably live in the house, the oil tank ran out our first night and the gas got shut off 4 days later. The oil was less our fault, but the gas being shut off was totally on me - apparently, I don't know how homes work and I assumed that the oil tank powered our stove since it powers the heat and hot water. Needless to say, we finally got it straightened out this past Thursday so I was able to cook my FIRST real meal in over 2 months - Chicken Fajitas in my brand new Cuisinart Dutch Oven! I have been DYING to use the dutch oven ever since I found it at a ridiculous price at our local HomeGoods. I always try to prepared large quantities when I cook because Chance basically eats for 4 people so every recipe has to be AT LEAST doubled. You can easily half this recipe and serve 8 people, but the leftovers really allow the flavor to soak into the chicken and it tastes great days later. Enjoy the full recipe below! Need a boost? This homemade cold-brewed coffee will definitely wake you up and keep you up. If you're a coffee (or caffeine) addict like Chance and me, then you will really appreciate this easy brew. I started making cold brewed coffee about 5 years ago while I was in college. Back then, I was always hurrying from class to class and didn't have time to make a fresh pot every few hours or the money to constantly be buying a cup at Starbucks. This recipe saved time and kept me focused, plus you can make it ahead and it's really simple - YOU ONLY 3 INGREDIENTS! 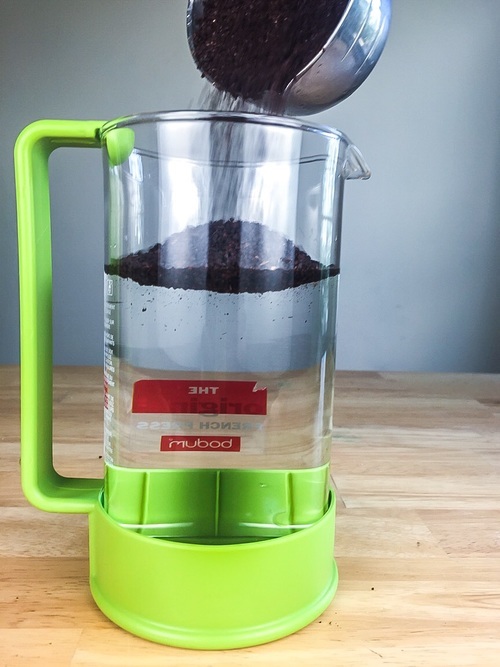 I use a Bodum French Press to make my cold brew, linked below! I suggest using really good coffee for your cold brew to get the best results, but any coffee will ultimately work. I get my coffee back in Virginia from Rostov's, a local shop that roasts their own coffee in Richmond. If you're ever in the area I highly suggest you stop in there! Not only do they have the best coffee, but their staff is extremely helpful and friendly. They always make you feel like family. You can order online too! 1. Fill your french press up with 4 cups of water and add 2 cups of coffee grounds. 2. Let the mixture sit for 12 hours or overnight at room temperature. 3. Serve immediately on ice or let it sit in the fridge. **NOTE** BEFORE YOU SERVE, this mixture is highly concentrated. You will need to add an additional 4 cups of water once it's finished brewing, or half water and half coffee each time you make a cup.